Your Walking Billboard: BIG GAME at Game Time in GCTC! BIG GAME at Game Time in GCTC! 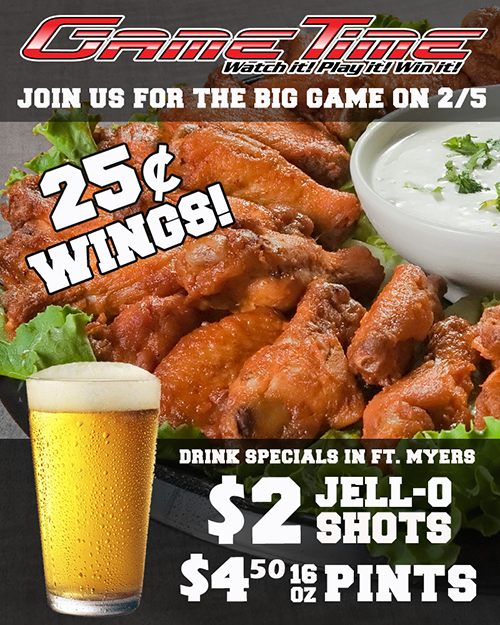 Serious wings & drink specials for the BIG GAME at GameTime in the Gulf Coast Town Center - 25¢ Wings, $2 Jello Shots on 2/5, 6 pm! Get your game on at GameTime – the perfect spot to watch the BIG GAME! GameTime offers a delicious menu, a full liquor sports bar, indoor/outdoor seating (in Miami & Fort Myers) and over 65 TVs to watch the game. Then take the fun into the Mega Arcade with over 120 interactive games. It’s fun for all ages and a great place to host your BIG GAME watch party! 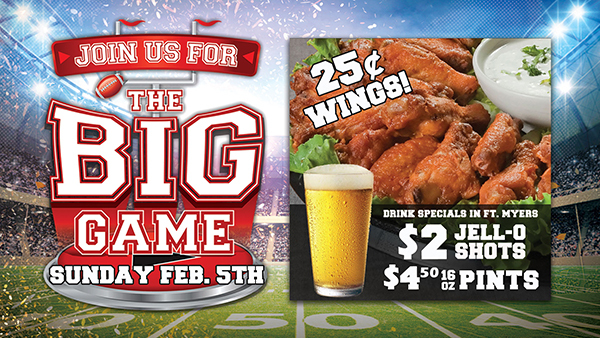 25¢ wings* & drink specials starting at 6 pm for the BIG GAME on February 5th!